The Morgan Library and Museum is a complex of buildings that serve as both a research facility and a museum. 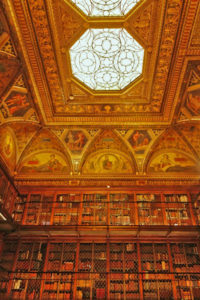 The library was originally founded to house the private collection of J.P. Morgan. Mr. Morgan’s initial collection includes rare books, prints, and drawings, and has been expanded over time to include important music manuscripts, early children’s books, Americana, and materials from the 20th Century. The McKim Building, named for it’s architect, is the oldest portion of the complex and houses the original library, study, and rotunda. 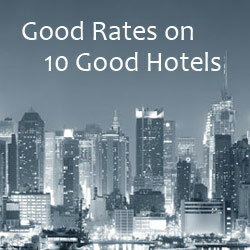 The rooms are beautifully designed, with ornate ceilings and finely crafted woodwork and bookshelves. The complex has experienced some recent changes. 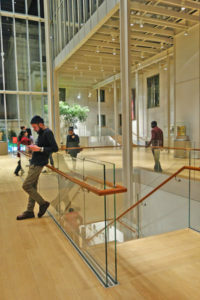 A large expansion, designed by award-winning architect Renzo Piano, was completed in 2006, and the McKim building interiors were restored in 2010 (at a cost of $4.5 million). The Morgan Library and Museum is located at Madison Avenue and 36th Street. Admission to the museum is free on Fridays from 7:00 pm to 9:00 pm. Admission to the McKim Rooms only (which include Mr. Morgan’s Library, Study, Rotunda, and Librarian’s Office) is free on Tuesdays from 3:00 pm to 5:00 pm, Fridays from 7:00 pm to 9:00 pm, and Sundays from 4:00 pm to 6:00 pm. You can always visit the Morgan Shop, Morgan Dining Room, and Morgan Cafe without paying museum admission. Regular admission for the Morgan Library and Museum is $20 for adults, $13 for seniors age 65 and over, and $13 for students with a current ID. Admission is free for children age 12 and under (must be accompanied by an adult). 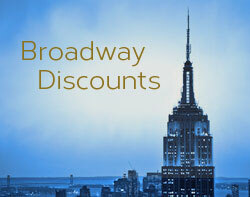 Please visit the Morgan Library and Museum website to confirm admission costs and hours of operation.